One of the things I like to do as a genealogist and avid but amateur historian, is to find out about my ancestors in history. By that I mean once I find an ancestor, I make note of his dates of birth and death, and his geographic locations during his life time. Then I look for events that happened during my ancestor's life. You may find out about a fire in the town where he lived, a series of droughts or hard times in his farming community - perhaps he lived through a recession. But try to think of your ancestor experiencing the same emotions as you do! Going through the same trials and times as you. How do you find out about all these events? Newspapers are a great source for interesting items in the town or community or country where your ancestors lived. You can either search using keywords (fire, earthquake, drought, and so on) or by choosing a specific day and reading the newspaper for that day to see what happened. Here are some newspaper archives online that I use in my searches. * NewspaperARCHIVE.com I am a big fan of this website. I like the display of the newspapers and how quickly they load for me. My husband has ancestors who all lived in one small town for generations. So his method of setting them into history was to start reading that small town newspaper, one day at a time. He likes to read it as if he were living there and the paper was coming to his door, that is - he reads each day's paper until he finishes the year. Then he starts over on January 1st of the next year. However you choose to approach the job of learning the historical events so you can set your ancestor in them, you can be sure your ancestor will come alive for you. Carnival of Genealogy, 77th Edition is about Disasters. The prompt states "For the next Carnival of Genealogy, tell about a disaster that one or more of your ancestors lived through: Did they survive a hurricane, flood, tornado, train wreck, sinking ship, plague, genocide, explosion, mine collapse, or some other terrible event? How did they survive?" Isaac was imprisoned in Albany three times by the Americans for his loyalty to the British King. After his release in 1777, Isaac joined the Loyalist unit Butler's Rangers and fled to Canada. Mary was left with ten children ages 2 to 18 years. Mary continued to aid the British, and in 1779 she and the children were taken from their home at North River, New York, by American patriots. Their home and all their clothing and belongings were burned by the patriots. The patriots then forced Mary and eight of her children (two of her sons ages 14 and 18 had already joined their father in Butler’s Rangers) to march 80 miles north through the forest. There they were abandoned by the Patriots and left to die. Mary’s youngest child was only 4 years old. 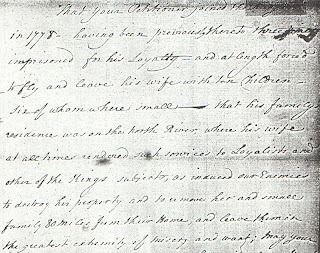 An excerpt from one of the affidavits presented to the Council when Isaac petitioned for his land grant in 1797 briefly describes Isaac's imprisonment and Anna Maria's ordeal. Luckily friendly Indians found the family and took them to Montreal where they joined Isaac and the other Loyalist families who had made it to safety. In Montreal, the starving Loyalists were given food, blankets and minimal clothing. The British government had not made provisions for so many Loyalists’ families arriving with nothing but the clothes on their backs. For 5 difficult years the Loyalists and their families were quartered at a small barracks and given a meager allowance of food rations, blankets and clothing by the Government. But the family survived, and Mary with Isaac and 9 of their children agreed to join other Rangers and families who were promised land in the Niagara area of Ontario. In April 1784 the family arrived at Niagara, where they would make their home. Rations were still dispensed to the settlers as after 5 years of living with nothing to call their own, they still had no land, and no homes. Again they were quartered in barrack style living and so they began to build their own shelters on land that was not theirs. A descendant of one of the refugee families states that the family dinner-table was a huge stump, hewn flat on top, standing in the middle of the floor. When their clothing wore out, the settlers made new garments from deerskin. They also had yet to endure (and survive!) what became known as “The Hungry Year” in 1787 In that year the government stopped giving out food rations. But there was a drought, then a freezing winter, and no grain crop or supplies. Many families had neither guns nor powder to shoot what game was near. Many starved that winter in Upper Canada (Ontario). The Loyalists and their families were reduce to eating leaves and drinking water which had been boiled with a bit of bark in it. Mary’s oldest son soon gave up and returned to New York where he married and raised his family. Loyalists and their families had to present their petitions for free land to the Council where they were read and then a decision made. Even if a Loyalist received his grant of land it was not likely to be the land where he had begun building his new home. Families were often separated and older men who had counted on their young sons being next door to help them clear the land and farm it, were suddenly on their own. Their sons might be hundreds of miles away. Life had been a struggle for Mary and her family from 1775 until 1797 when she and Isaac were finally granted their 500 acres near what is now St. Catharines Ontario. 22 years of hardship, danger and starvation – far from home and with family left behind. How many of us could (or would!) endure that for the sake of remaining loyal to a distant ruler? I admire Mary and Isaac and all the Loyalist families tremendously for their courage, their spirit and their refusal to commit what was in their minds, an absolute betrayal to King and country. The 50 foot ship reconstruction, based on drawings and documents found in the Amsterdam Archives, started in 2006 in Schenectady at the site of the former Mabee farm. Interested historians, genealogists and others can now adopt a piece of the ship, such as the sail, stern, keel, or a plank used in building it, by making a donation to the project. Contributors receive a certificate and their name inscribed on a plaque which will be placed on the ship when it is completed. It's a fascinating glimpse into early American history! Those interested in this time period and in New Netherland, may view a set of ships passenger lists for 81 ships sailing from Holland (the Netherlands) to New Netherland from 1624 until the English takeover in 1664. Many of these lists have never been published online or offline and are part of an ongoing project to reconstruct the lists based on a variety of primary sources. LOST FACES is my collection of Antique Family Photo Albums. Most are from the Civil War time period with CDVs (Cartes de Visite) and tintypes. Some are Cabinet Cards from the 1880-1900 time period. Lost Faces is my way of saving genealogy treasures and preserving historical documents. Some albums that contain funeral cards, memorial cards, obituaries, Christmas cards, and hand-written genealogies. Today I have uploaded the Alexander and Boomhauer Family Photo Album to Lost Faces. It consists of 25 Cabinet Cards and Cartes de Visite from 1870 on. 21 photos are identified by name! There are almost 60 photo albums online at Lost Faces for you to look through. That means approximately 3000 or more photos of possible ancestors. Many of my photo albums are now online in their entirety for you to view and freely save photos for your own personal use. Albums that are not online yet have the option for you to view thumbnails and order quality reproductions of an ancestor. The World War I Service Statement Cards, 1917-1919 (Department of Veterans Affairs), indexed by Washington Historical Records Project volunteers, are available and searchable online at the Washington Digital Archives. Information contained in the records includes full name, serial number, race, place inducted, place of birth, unit assignments, ranks attained, engagements fought in, wounds received, dates served overseas, date of demobilization, and degree of disability (if any). As of May 22, 2009,721,138 full page newspaper images were published. A complete list of newspapers and dates is available in pdf format. The Arts and Humanities Research Council (AHRC) has awarded a Research Grant worth just under £500,000 to Dr Adrian Bell of the ICMA Centre and Professor Anne Curry of the University of Southampton to challenge assumptions about the emergence of professional soldiery between 1369 and 1453. The online muster roll database currently holds just under 90,000 service records. These are taken from muster rolls, housed in The National Archives (TNA), for the years 1369 - 1453. The online protection and attorney database currently holds just under 20,000 records. These are taken from the treaty rolls, housed in The National Archives (TNA), for the years 1369 - 1453. The Garrison database is in draft form at present. This is in order to stress test the database, as it contains over 110,000 service records. The records are drawn from mainly French repositories and record service for the English crown, in the occupation of Normandy from 1415 - 1453. A pilot project database is now available for searching. Ottawa, July 22, 2009 - Library and Archives Canada (LAC) is pleased to announce the release of a new version of theCanadian Naturalization 1915-1932 online database. It now includes the names of 206,731 individuals who applied for and received status as naturalized Canadians from 1915 to 1932. This database is one of the few Canadian genealogical resources specifically designed to benefit those researchers with roots outside of the British Commonwealth. References located in the database can be used to request copies of the actual naturalization records, which are held by Citizenship and Immigration Canada. Authorities plan to give the public access to a searchable online database of nearly 100,000 graves at the historic black cemetery where four people are accused of digging up graves to resell the plots. The database may be available later this week according to Cook County Sheriff's office. The database was created using existing records from Burr Oak Cemetery and county death certificates. Genealogy Family Hope Chest in Family Tree Magazine! It was quite exciting to see an article Called "Best Hope" in Family Tree Magazine September 2009 issue. The article (on page 17) is based on my blog series Genealogy Hope Chest. The Family Tree Magazine article lists my 8 steps, with a brief summary of each, and includes a photo of some of my family treasures that have been passed on through the generations to me. NewspaperARCHIVE,(at NewspaperARCHIVE.com) in partnership with Stars and Stripes U.S. military publication, announces the online release of the Stars and Stripes historic newspaper archive. Stars and Stripes, the daily independent news source for the U.S. military community, has partnered with NewspaperARCHIVE to digitize and make its entire microfilm archive available online. This partnership, which also includes microfilm preservation of Stars and Stripes newspapers, gives libraries, historical societies, educational institutions and individuals online access to more than one million pages of historic newspaper content never before available. "We are proud to be able to distribute this historic military publication," said Jeff Kiley, General Manager of Heritage Microfilm. "Researchers across the globe will now have access to Stars and Stripes, which has been reporting on major headlines from the front lines continuously since World War II. The newspaper's archive offers readers a global perspective on events that shaped the world's history, such as the Vietnam War, the moon landing, the fall of the Berlin Wall and much, much more. Stars and Stripes is a wonderful research tool for historians and genealogists, containing a wealth of information about American service members and the events which shape their history." The archive is the culmination of nearly two years' worth of work assembling the best microfilm of the Stars and Stripes collection available, scanning it into digital form, inspecting each image for irregularities and quality issues, correcting any problem images, and building a fully-searchable digital archive website. Content from Stars and Stripes is featured on NewspaperARCHIVE at NewspaperARCHIVE.com. The archive is divided in two editions ż the Pacific Stars and Stripes and European Stars and Stripes. The Stars and Stripes collection is integrated into almost 100 million additional newspaper pages of valuable content from the U.S. and around the world, dating as far back as 1753. Smile For The Camera "Bling, ancestor Bling." The 16th Edition of Smile For The Camera is "Bling, ancestor Bling." The word prompt is "Show us a photograph of your ancestor wearing their "Bling," or photographs of the pieces you have inherited. " 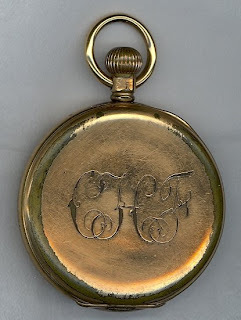 I also have Grandad's signet ring with his initials and I used to have his silver watch fob and engraved match case but they were stolen many years ago. I have felt great sadness ever since they were taken and have chastised myself for not keeping them locked up instead of on display in our home. I find myself looking at every case and fob in antique stores in case one day his turn up! PROVO, UT--(Marketwire - July 16, 2009) - Ancestry.com, the world's largest online commercial resource for family history, today announced that the company, in collaboration with Virgin Islands Social History Associates (VISHA), is launching a significant online collection of Caribbean slave records detailing nearly 200 years of St. Croix-Virgin Islands history. This unique collection is a product of the St. Croix African Roots Project, initiated in 2002 by VISHA to bring together records that document the population, families and individuals on St. Croix during the period of Danish rule. During the past seven years, VISHA collected, documented and transcribed a vast array of historical records found in American, Danish and Virgin Island archives. These records together in one collection help individuals of African descent chronicle the lives of their African and Creole ancestors as they negotiated enslavement and freedom in a New World plantation society. To make this collection more accessible, Ancestry.com is working with VISHA to digitize and put online the St. Croix African Roots Project documents, which will help tens of thousands of people trace their ancestral roots, some to individual Africans and specific African homelands. The first installment of this collection that went online today includes the U.S. Virgin Islands St. Croix Slave Lists (1772-1821) and Population Census (1835-1911), which together contain information on more than 700,000 slaves, owners and family members. These St. Croix African Roots Project records will be searchable for free on Ancestry.com until the end of July. You've found a box of old photos in your great-aunt's attic. She doesn't want them and tells you to go ahead and take the box. Some of the pictures are identified by name but you've no idea when the photos were taken! What do you do now? The first thing you need to do is figure out the approximate time period of each photo. Is it 20th century, or 19th century? Mid 1800s? Late 1800s? How do you figure it out? 1. Type of photo - Tintype, daguerreotype, Carte de visite, cabinet card, 1900s home photos - narrow your time frame by first identifying the photo type. 2. Photographer's name (if there is one). Research the photographer. Find out when he or she was in business. 3. Photographer's mark and logo on the back of a CDV (Carte de Visite). Marks and logos changed over time from none to simple to more elaborate. 4. Fashion, especially women's fashions. Are the skirts full? Do they have hoops? Crinolines? Do they simply fall from the waist? Does the dress have full sleeves? Tight tapered sleeves? Dropped shoulder? A Yoke effect? High collar? Low collar? Natural wwaistline with belt? Dropped waist? Bustle? All these and more indicate fairly specific years. 5. Hairstyles. Women's hairstyles in particular changed over the years. Look to see if the ears are exposed or covered. Is hair parted in the middle and swept back severely? Is it low on the nape of the neck? Is it in sausage curls or ringlets? Is it gathered high on the top of the head? There are many variations and every one is typical of a fairly specific time period. 6. Is there a Revenue Stamp on the back? This dates your photo to 1864-1866. If you're lucky, the photographer date stamped his revenue stamp as he was supposed to. There are many details you can also look for when attempting to date an ancestor photo. See Hints For Dating an Ancestor Photograph for information on Photo Corners (round versus square cut), quality of photograph cards (thin, thick), colured backings versus non-coloured etc. It's a great feeling to get a box of old family photos and be able to slot them into time periods! Why not join us on Lost Faces: Ancestor Photos & Albums on GenealogyWise. This is a group I created to talk about our old photos and to help each other identify the years taken. FREDERICTON – The incredible tale of the unclaimed remains of a Canadian woman at a London cemetery, and efforts to send her home after almost a century, has caught the interest of a major airline. Barry Smith of The Friends of Kensal Green Cemetery says Air Canada has offered a free flight to ship the coffin from London to Halifax. 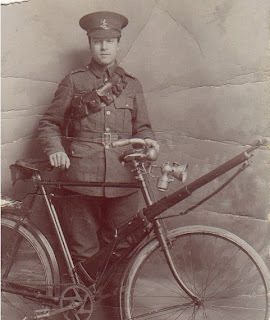 Gladys Winifred Fowler was 18 when she died in April 1917. Some time ago on a ships passenger lists mailing list, my friend Sue Swiggum of TheShipsList.com discovered that the total number of passengers on a filmed Ellis Island list matched the number of third class passengers only. All other passengers were missing. Investigations and consultation with a knowledgeable colleague gave us the answer to the puzzle of the missing passengers. There are always exceptions, but in general from about June 15th 1897 until approx. March or April 1903, the lists for first class and second class passengers were not collected at Ellis Island and do not survive, so therefore will not appear on microfilm, nor in the Ellis Island online database. So if you are looking for ancestors and you are 100% positive they arrived at Ellis Island between 1897 and 1903, be aware that if they travelled first or second class, you might not find their names. I got wise. GenealogyWise that is... yesterday I joined GenealogyWise.com. GenealogyWise is a new social network site and when I first heard about it I thought "Oh no, just a Facebook wannabee..." I didn't expect to like it. I decided to give it a try though before giving it the thumbs down. I am giving it one thumbs up and reserving that second thumb until more time has passed. I want to see if the initial euphoria and excitement of it wears off over time. 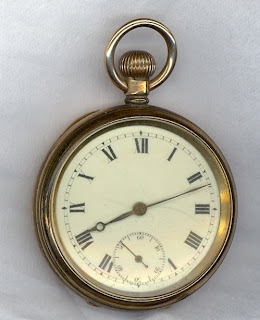 It is set up just for genealogists and it is rather nice to be connected to others who are passionate about genealogy too! Not that I will give up Facebook. I have hundreds of friends, family and colleagues on Facebook and I enjoy everything I do there. But the more time I spent on GenealogyWise yesterday, the more I realized I can use both of them. And GenealogyWise is the hottest thing in cyberspace right now. It took off like a rocket. When I joined there were about 200 members. 24 hours later there were over 1,000. You can link to me as Friend on My Page if you decide to pop over and give GenealogyWise a try. I hope you'll consider joining me, and other genealogists, in these groups. And there are hundreds more run by other genealogists! There's lots you can do on GenealogyWise - Blogs, Forums, Groups, Videos, Photos.. you name it you can look at it or participate in it. It's free and easy to register, being part of the NING social network sites. If you are already registered with NING all you'll need to do is log in with your NING ID. Otherwise all you need do is give an email address, a password and fill out a brief profile page. Today's featured set of little-known Genealogy resources is Coffin Plates. Yes - coffin plates, also known as Casket plates, coffin plaques and casket plaques. The history of Coffin Plates or casket plates is a long but not very well documented one. Coffin plates are decorative adornments that contain free genealogical information such as the name and death date of the deceased. 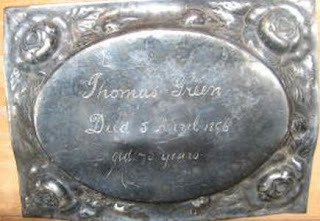 Sometimes the coffin plate was attached to the coffin and removed before burial, then given to the family to take home as a remembrance token. Other times the coffin plate was placed on top of the coffin in a stand, then given to the loved ones after the funeral. Brian Massey of AncestorsAtRest.com has a very large collection of coffin plates online. There are over 500 individual coffin plates on Brian's website and they are all free for visitors to look for a Coffin Plate of an ancestor. The Quinte Branch of the Ontario Genealogical Society (OGS) covers Hastings, Prince Edward and southeastern Northumberland counties was one of the first areas settled by United Empire Loyalists in 1784. If you are searching for Canadian ancestors in other parts of Ontario see Ontario Genealogy for online databases and links. Do you have ancestors who may have made their mark on July 5th any year? In an interesting concept, for today only NewspaperARCHIVE.com is offering all newspapers in their archive from July 5 FREE! It's worth looking to see if any July 5th newspapers have mention of your ancestor's name. A historical glimpse of Canadiana – a bill of treason connected to the Upper Canada Rebellion of 1837 – has been found among the archives at McMaster University. Written on parchment and dated March 1838, the bill was filed against William Rogers, a yeoman living in or near Albion, York Township, Upper Canada. Rogers was arrested for treason on December 13, 1837, for plotting an insurrection against the Queen, persuading others to join him, and assembling with about 50 other people. In the indictment, Rogers is described as "not having the fear of God in his heart but being moved and seduced by the instigation of the Devil." He was tried April 18, 1838, and ultimately acquitted. Footnote,com announces an exciting new partnership between Footnote and the largest newspaper publisher in the US, the Gannett Company. Gannett, publisher of 84 daily newspapers including USA Today, will be able to digitize their vast archives for the first time by working together with Footnote. Through this partnership Footnote Members will be able to access valuable historical newspapers never seen before on the internet.